Rainfall can be hazardous in the Santa Cruz Mountains, especially in the area of the Loma Fire burn scar, where the September blaze decimated vegetation and increased the threat of erosion, flash floods, and mudslides. The wildfire ripped through nearly 4,500 acres, destroyed a dozen homes and 16 buildings. And on Thursday, nothing, not even small dams constructed by residents, was able to stop water from rushing downhill. None of the charred foliage was able to absorb any water, forcing it to continue through the burned area into culverts and creeks, sweeping up trees and branches on the way. The ground in the Santa Cruz Mountains is also very unstable — in fact a small part of the hill gave way under the force of Thursday's storm — prompting Cal Fire crews to keep a close watch on the area. Firefighters spent Thursday clearing out streams and roads so people could get home. 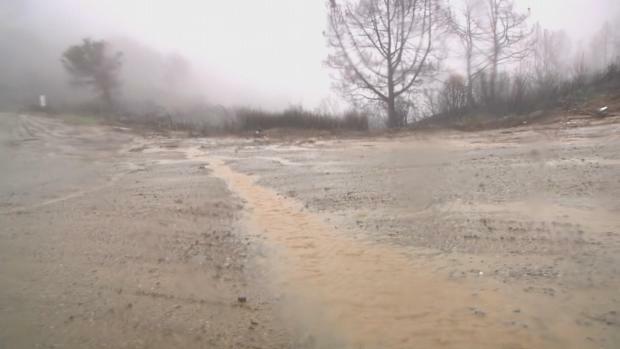 Rainfall can be hazardous in the Santa Cruz Mountains, especially in the area of the Loma Fire burn scar, where the September blaze decimated vegetation and increased the threat of erosion, flash floods, and mudslides. Ian Cull reports. Battalion Chief Mike Mathiesen said the Loma Fire and ensuing burn scar increased runoff in the area. "Normally it would absorb nicely," he said, but that wasn't the case on Thursday. Caltrans crews were also spotted along Highway 9, stopped wherever storm drains were clogged with debris. Emergency crews also marked a huge uprooted tree in Boulder Creek. Others with chain saws will cut it up once daylight breaks. 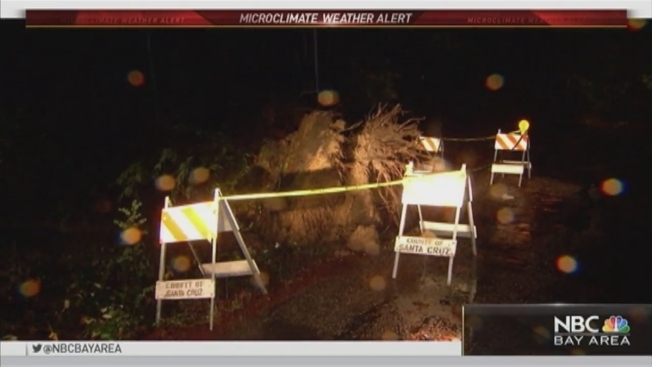 Residents were thankful for the additional help, but said they hope county officials could do more to maintain roads in the Santa Cruz Mountains, and make them safer for when storms like this one hit. Meanwhile, the potential for mudslides and erosion also has the Santa Clara Valley Water District taking short- and long-term action around Uvas and Chesbro reservoirs.